Christmas means a lot of things but in my family food is a pretty important part and more specifically, dessert is what I most look forward to. 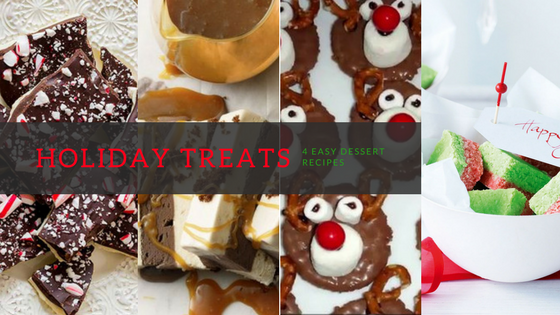 So I definitely have my fair share of favourite holiday sweets but here are four treats that exceed the usual caramel tart or pavlova. If you're struggling for dessert ideas to share with family and friends this holiday season I've got you covered. The best part about this recipe is that it can be customised to your preferences; white, milk or dark chocolate...maybe even a mix. This is a great way to use up leftover candy canes or add anything else you would like such as pecans or shredded coconut. See the blog post of the recipe here. Watch the tutorial for the recipe here. Chocolate...peanut butter... ice cream...can you get a better combination? Throw in popcorn and I'm in heaven. The salted caramel sauce in this recipe is out of this world. These cute little themed biscuits are perfect for kids and such a fun activity to do with your children or little siblings. It helps that they taste delicious as well. A holiday spin on the traditional Coconut Ice. As someone who loves coconut and anything sweet, these are amazing. Hope these helped! Happy baking!